In today’s time Private Sector play an important role in generating employment as every year lakh of vacancies for the various positions has been released by private organizations. 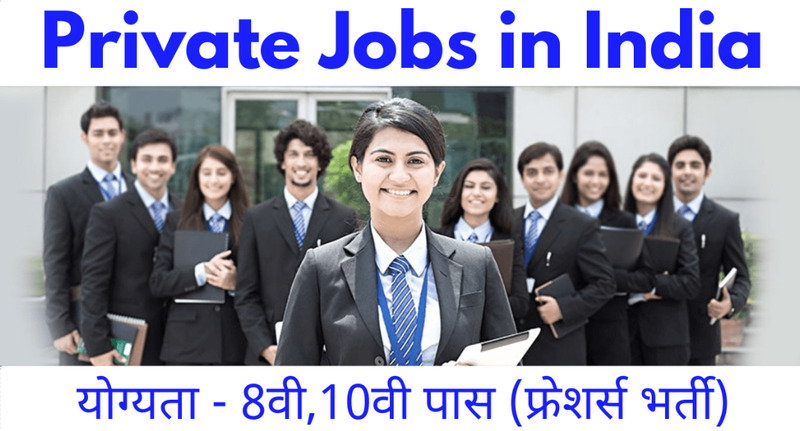 In this article, we are sharing you the details regarding Private Jobs in India 2019. We tried to cover all the private sector in which you can get a job. In addition, we have also provided the details regarding Career Opportunities in MNCs. Both freshers, as well as experienced individuals, can apply for the private sector jobs. Earlier the candidates want to get a job in the government sector but the time has changed now, now the demand of the private sector’s jobs is increasing rapidly and new generation wants to get placed in the private organization. The primary reasons behind it are an attractive salary package, good incentives, quicker increment, upper hierarchy, and other benefits. India is a developing country and one of the rapidly growing countries in the world, the private sector of India is increasing with the fastest rate which leads to generating good employment. At present, there are many reputed companies in which jobs are available some of the companies are Google, Facebook, Infosys, etc. In Private Sectors jobs are divided into various sectors like IT sectors, Banking Sectors, Medicals Sectors etc. So now let's discuss the sector-wise Private Jobs in India 2019 in which you can apply for the job. Software Engineering job/web Developer now becomes a most trending job in this Century. Software Companies are establishing day by day in various Countries and earning huge profit. As per salary, software engineering job getting a higher paid salary in various software development companies. Applicants should possess a graduation degree in Computer Science and Engineering or any other equivalent branch. The candidate who had done BCA, MCA, B.sc from a computer can also be the part of this job. The candidate should have knowledge of various programming languages and basics of computer architecture. A candidate should pass the graduation at least 60%. This is also trending jobs in IT Sectors, here candidate who has knowledge of network can work and earn impressive amount. Every software companies need network engineer for establishment of network and maintain the running of various servers. Aspirants must complete their graduation in IT field with at least at least 60% marks are eligible to apply. The candidate who had done the graduation from BCA, MCA, B.sc and 3 years Diploma from computer can also be the part of this job. Candidates are also applicable who has done diploma in networking. Call centers are divided into two parts that is International and Domestic. The working of this job is handling the customer of the particular companies via call or e-mail and sort out their troubles regarding the company services/products. Candidates having graduation degree of any stream weather it would be science side, commerce or art side are eligible. Requirements-: The candidate should have good English in speaking, reading and writing as well. The one of the demanding sector of the private sector is the banking sector, in today’s time every individual wants to get the job in the bank. There are the lots of private banks which provide jobs to the eligible individuals in the various departments. Now a day’s bank has also started additional services mutual funds, loan facilities, and all others. If you are the one who have a dream to work in banking sector then you can check the job details from here. A clerk is better options for the student who have completed their graduation. They can serve the bank as clerk post by passing the exam conduct by the particular bank. An exam will be moderate and syllabus is the same as all the banks conduct the exam (Government banks and Private Banks). Qualification required- Must have graduation in the concern filed and the candidates who are perusing last year of graduation are also eligible to apply. It must be noted candidates must have at least 60 % marks in graduation. Requirements - The candidate should know basic concepts of maths for managing the accounts in the banks and also have good communication skills. For this post the candidate should have a degree of Computer Engineering. The job contains the technical work. Work may be related database of the customer accounts, networking issues etc. Candidates have passed their graduation in concern filed with minimum 60 percent and have good communication skills. The candidates should have knowledge of technical skills like networking, database management system, operating system etc with practical knowledge. PO- PO is stands for Probationary Officers post in the bank its is one of the reputed job .PO plays a important role he manages the accounts of customer and deals which various transaction problems of customers. Qualification required-: The candidate should have pursued the graduation in any stream and candidates have secured at least 60% throughout their academics. Medical sector is one of the demanding sector in which students are most interested in making their career. The first reason for the growing attraction of students towards the medical field is a respectable job and good salary package. Medical Sector plays an important role in our society as the doctor is the person who has overcome the incurable diseases of individuals. The profession of doctor’s lifestyle, social standing and the income from this profession are some of the reasons for which the students are keen to become a doctor for the sake of creating a respectable career. Read: क्या है कर्मचारी पेंशन योजना (ईपीएस) ? In order to be a doctor individuals must completed their graduation and post graduation in the concern filed and also must have completed their training in the recognize hospital or clinic. After completing the training individuals have to apply for the license for his/her career path. Surgeon-: Surgeons are also known as ‘Life-saving Human Being’. The surgeon is also the one highest paying job in Medicals. The candidate has to be specialized in a particular part of body so that it can remove or repairs from defect in our body. A person can become Heart Surgeon, Bones Surgeon, Neural Surgeon etc. The candidate who wants to become a pharmacist should undergo university-level education to understand the biochemical and actions of drug and their uses. Every pharmacist should hold the degree of either ‘Bachelor of pharmacy’, ‘Master in Pharmacy’ or ‘Doctor of Pharmacy’. In today’s life marketing jobs are must demanding job, the management professional helps in running the business, Management professionals are the key player of business companies. They manage all the prose and crones of company and help in running a good enterprise. One can be the part of this professional by pursuing BA and MBA degree. Management professional also deal with the marking part and they well know how to sell or introduce the product of company. For getting success in management professional your communication skills should be very strong. Candidate should pass their graduation from BA and MBS (mandatory) to get a good job in the top MNC’s. Private Sector or the Top Level Private Companies provide growth to their Employee at a very fast rate. There are various Private Sector Companies which provide maximum satisfaction to their employees. There is different Posts/Jobs available in various Multinational Companies of Private Sector for which individuals can apply. Even many of the companies also provide jobs to the fresher’s aspirants. Private companies play an important role in employment as every year there companies provided laks of jobs in various fields. So if the Talented Freshers and Experienced Working Professionals and want to work with the renowned Companies and MNCs of the World then don’t miss this Opportunity, Getup & Go for it. Collect all the Degree/Diploma/Certificates etc. Qualifications related/proofing Documents along with their two photocopies of each in an Enclosure. Make an attractive Resume or CV on basis of your qualifications. Also, you can Drop the Resume over the Web page of your desirable company on its Career Link. There are lots of Job Consulting Companies running over Internet which provides the facility to find a Dream job in almost all Private Companies free of cost like linkedin.com, fresherworld.com, naukri.com, shine.com etc. Where you can post your resume and can easily find a Job Notification from the Job Portal on the Basis of your Qualification. There are lakhs of Openings in Private Organizations or Blue Chip MNCs. The direct links to apply for these job positions are available on this web portal. Aspirants are advised to follow the steps available on how to join the dream job private organizations. Aspirants are also advised to grab the chance as soon as possible before the Openings are closed.